One of the most melodic and romantic genres of music is that found on the streets of Paris as played on the musette. 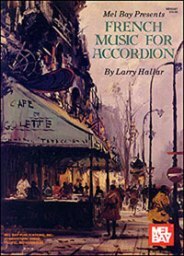 Larry Hallar has artfully crafted keyboard accordion solo arrangements from 25 favorite French musette compositions. These are wonderful solo pieces for any accordionist, and convey the lyrical beauty and romance characteristic of the genre.